I am on a Grainline roll lately. Last week, with the pressure of warm weather in the forecast and nothing to wear for Memorial Day, I whipped up this shirt with zero planning, hoping that it would fit. It is really just the test drive for the eventual final draft (coming soon) of the Tiny Pocket Tank. I'm happy enough with the result that this top will at least see a few hot July days at the playground. At first I wasn't sold on the narrow at the top, full at the bottom style of shirt, for my narrow at the top, full at the bottom style of body. I normally prefer to accentuate the relative smallness of my waist, but I think the fit of this tee makes it work. The fit is one reason I've never purchased one ready made. Even in knit, they always pull and bunch up at the hips and gape at the chest. Anyone keeping track can mark a check firmly in the "pro sewing" column for this style. 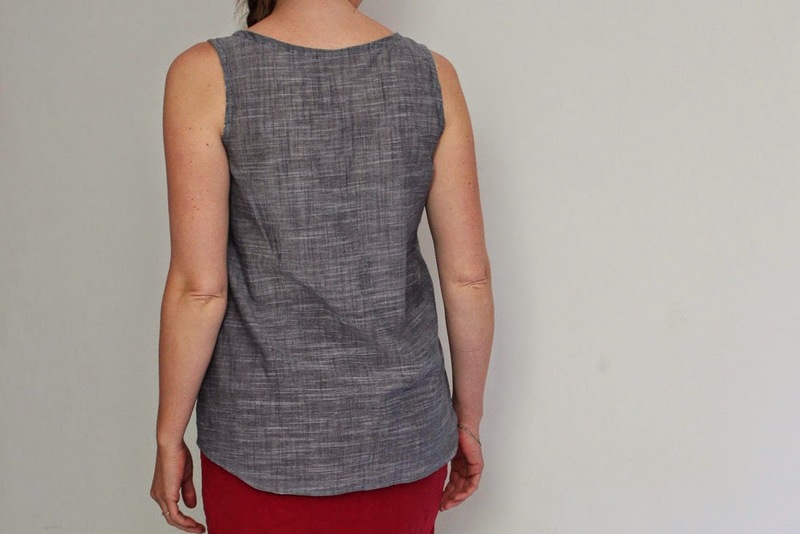 PATTERN: This is the Grainline Tiny Pocket Tank and the pattern is true to Grainline Studio's great reputation. The style is current, the fit is accurate. The instructions are a bit sparse if you're used to more explicitly written PDF pattern instructions. FABRIC: This is a Robert Kaufmann chambray Union Light in Indigo that I originally bought for J's Easter vest. As soon as I touched it I realized it was totally wrong for the body of that project, though it would have been fine for the lining. Its fine for this woven tee, though its sheer enough that if I had more fabric, I would have fully lined the shirt, rather than use the binding. 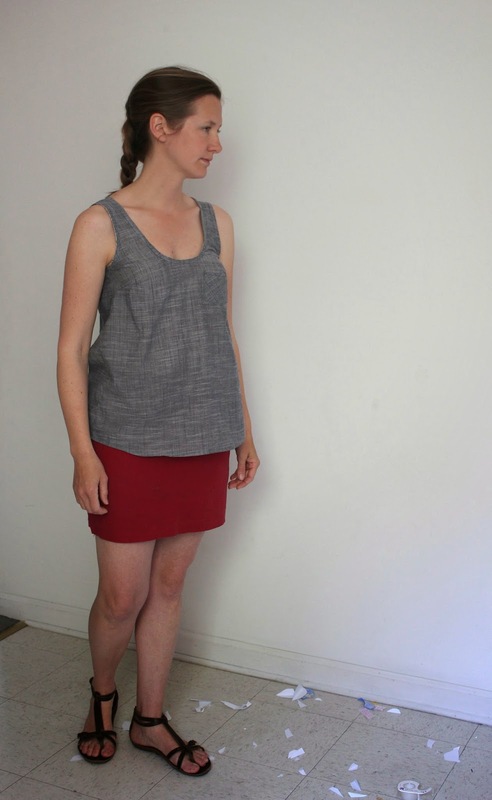 I made the binding in another fabric, which allowed me to make the body of the shirt with 1 yard of fabric. The binding is a big fabric eater. FIT: I cut a size 4 at the bust, graded to a size 8 at the hips and increased the length in the back to a size 16. It is a tiny bit snug across the top of my chest (you can kind of see that here), next time I will cut a 6 at the bust. This design is pretty lean on the details, not necessarily a bad thing, unless you've got photo space to fill with something other than a selfie. My binding is a bit heavier than the fabric of the body, not ideal, but plenty close for rural work. In short, great pattern at a completely appropriate price. I hear Jen is about to retool her website and raise a few prices (which are admittedly low compared to other indie designers). Pear shaped women of the world wide web, stock up now! Voice inside my head: I wonder if I'm too old to be wearing a mini skirt I bought in college? Perhaps there is a Moss in my future. I wonder if I should have cleaned up L's craft scraps before I took this picture? What am I going to put in this tiny pocket? 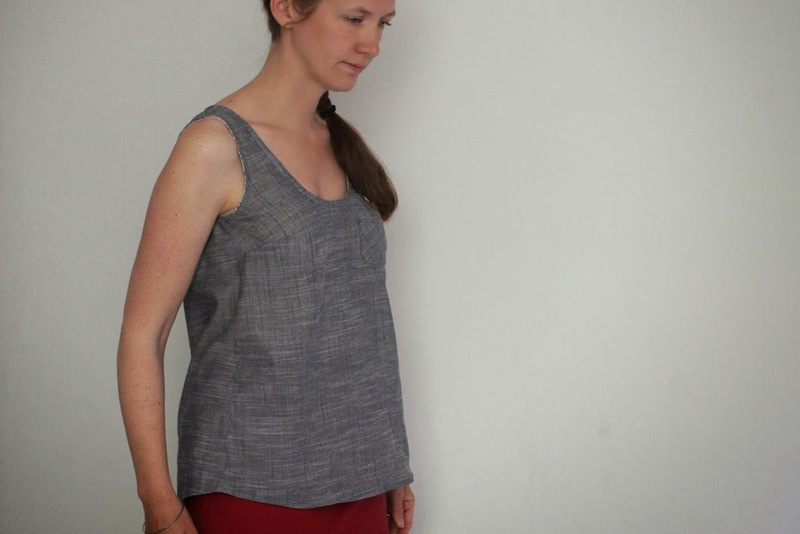 Kristi, the tank looks beautifully sewn. Also, no - you're not too old for a mini:) I bought the moss skirt over the weekend and have an anchor print slated for it. Let's make one!